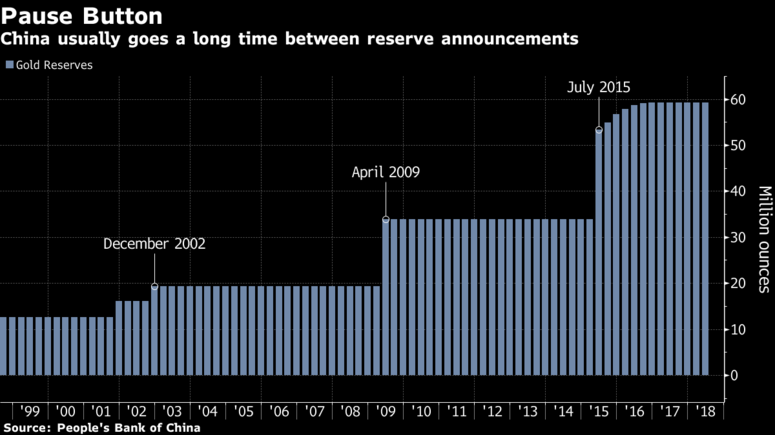 “The strategic imperative is probably still there to add some gold to reserves quietly bit by bit,” said Philip Klapwijk, managing director of Precious Metals Insights Ltd., a consultancy based in Hong Kong. “The reason to own gold as a portfolio diversification is even better given the rather strained relations with the U.S.,” said Klapwijk, who has tracked precious metals for nearly 30 years. The country will announce at some stage that they have increased gold holdings quite significantly, but the question is by how much, said Mark O’Byrne, research director of Dublin-based precious metals broker GoldCore Ltd. The purchase announced on July 17, 2015 was less than some analysts had expected and the price dropped 1 percent that day to $1,134.14 an ounce. Bullion traded at $1,223.53 on Friday.